–Today, the Atlantis crew departs the International Space Station and begins its return to Earth. 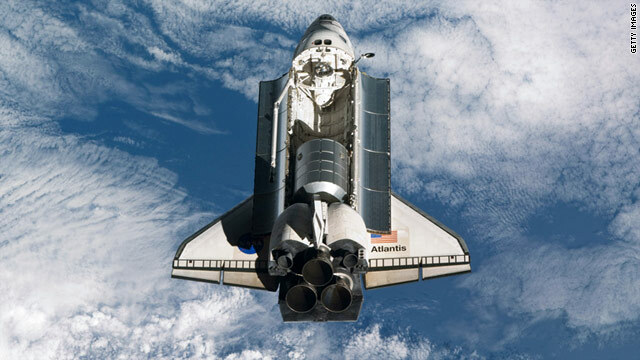 Atlantis, NASA's final mission of the space shuttle program, is scheduled to land Thursday at Kennedy Space Center. An amateur astronomer shot this super-cool video of Atlantis docked to ISS; Discover Magazine blogger Phil Plait says it looks legit. –The Dawn spacecraft, a NASA probe with no humans aboard, entered orbit around the asteroid Vesta on Saturday, 117 million miles from us. It is the first spacecraft to enter orbit around an asteroid belt in our solar system, Scientific American reports. "The pictures and data Dawn returns may never dazzle the public the way the Hubble Telescope's great portraits of the cosmos have. We'll have to settle instead for learning a lot more than we ever knew before about the origins of our solar system — and thus of ourselves," writes Time's Jeffrey Kluger. –Words may be more than arbitrary sounds, suggests an article in New Scientist this week. Some word sounds may actually have deeper connections with the senses. For instance, one study found "sweet tastes were associated with high vowel sounds, in which the tongue is placed nearer to the roof of the mouth, and back vowels, where the tongue is placed towards the throat rather than the lips." –A 563-foot naval destroyer, the USS Arthur W. Radford, is going to be sunk into the Atlantic Ocean, with the aim of luring fish and creating a new ocean habitat, not to mention creating touristic opportunities. But do artificial reef projects do more harm than good? The Washington Post investigates. –Moles can dig so well because they appear to have an appendage resembling an extra thumb. But researchers now believe that it's not a "thumb" per se, but actually starts out as a wrist bone, the BBC reports.